My relationship with the Marvel Cinematic Universe has always felt like that of being on the outside looking in. Avengers: Infinity War is the nineteenth film in this franchise and I’ve only missed two of them: The Incredible Hulk, which was back when Edward Norton portrayed the green beast instead of Mark Ruffalo, and Thor: Ragnarok from November of last year. But I say my perspective is of the outside looking in because while I have enjoyed almost all of these films, and also enjoyed Infinity War, I’ve also found that most of them don’t stick with me for very long. Keeping up with the MCU can certainly feel like a chore, and as one who has really only kept up with the universe mainly because they are some of the movies to see every year, I’m not as invested as I might otherwise be. They’re no Star Wars or Lord of the Rings — franchises where I’ve seen the movies countless times and could recite almost any bit of info you ask me about. With the MCU, I would struggle mightly to remember A) what happened at a given time, and more so B) what movie it took place in. With the exception of Iron Man and Guardians of the Galaxy, I don’t think I’ve actually watched any of these films a second time; typically not the sign of great films. Each time a new film is released I consistently spend the first couple scenes trying to jog my memory of where we left off in the last one. Which brings us to Infinity War. I probably didn’t do myself any favors by missing Thor: Ragnarok because I’m pretty sure the ending of that film has been entirely spoiled for me now. And also left me deeper in the hole as I did my whole “What happened last time” — sidebar: perhaps the MCU movies should have “Previously On”-style segments at the beginning of their films now; going on 20+ films I feel like that would help a great deal. As usual though, I did get up-to-speed fairly early on and could sit back for the ride I was about to embark on. The Russo brothers, who previously directed the second and third Captain America films, The Winter Soldier and Civil War, returned to helm Infinity War and the currently untitled sequel. It’s a daunting task that couldn’t have been easy, trying to incorporate dozens upon dozens of characters into any form of coherent story. But accomplish that feat they did. 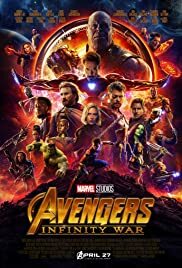 Infinity War lacks some of the originality and uniqueness as seen in films like Guardians of the Galaxy and Ant Man, but it is easily the most ambitious. Despite the derision and humor directed at Marvel for marketing the film as “the most ambitious crossover event in history”, I think it is really accurate. At just under three hours in length, it’s a doozy of a film, but it never feels rushed nor full of filler. I never asked myself where one of the characters went and why we weren’t seeing more of them nor thought that any one dominated the screen for the entire time. Also, to bring back one of my trusty ways for measuring enjoyment of a film, I didn’t look at my watch once during the film to see how far in we were. Infinity War is ambitious not just because there’s a lot going on, many moving parts with more characters than you can count. It is ambitious because it actually success at incorporating all elements of the story so seemlessly, I’m wondering how anyone doubted it could’ve been done. Perhaps this is all part of a post-movie halo effect I see to always be subject to with the MCU. I walk out singing its praises, marvelling (ha) at the skill with which so many storylines were weaved together. But fast-forward any number of months and I’ll be where I was at the beginning of this review: struggling to remember what happened in this film. Granted, I think that will be at least marginally easier with this film, because a lot (I mean a lot) of big, spoiler-y things happen. The stakes have been raised, deaths have occured and (seem) to be final, and the big bad Thanos (Josh Brolin) commands every bit of fear that has been hinted at for quite a few movies now. But even if I do remember more, simply because the stakes are higher, does that make it a good film? In the end, I’m going to look past all of that and focus on the simple fact that I was fully engaged for all three hours I was seated in the theater. Avengers: Infinity War is, if nothing else, good entertainment. And if you’ve devoted all the time watching all of (or almost all of) the Marvel Cinematic Universe, Infinity War is the beginning of a payoff after years of build-up. More than just the beginning of a payoff, it is chockablock funny moments, stressful ones, sad bits, and fight scenes galore. You will get your money’s worth seeing this in a theater and if you’ve come this far in the MCU you deserve to see Infinity War. Let’s save the question of where this falls in the pantheon at a later date — hopefully after a re-watch, something not usual for me and Marvel films.